We talked about Managed Disks, now let’s use them. 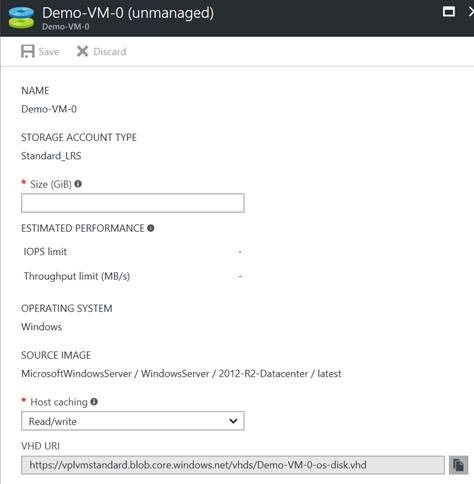 Let’s migrate existing VMs from unmanaged to managed disks. "description": "SKU of the VM." "id": "[resourceId('Microsoft.Network/publicIPAddresses/', variables('Public IP Name'))]"
"name": "[variables('Front Address Pool Name')]"
"id": "[concat(resourceId('Microsoft.Network/loadBalancers', variables('Public LB Name')), '/frontendIPConfigurations/LoadBalancerFrontEnd')]"
"id": "[concat(resourceId('Microsoft.Network/loadBalancers', variables('Public LB Name')), '/backendAddressPools/', variables('Front Address Pool Name'))]"
"id": "[concat(resourceId('Microsoft.Network/loadBalancers', variables('Public LB Name')), '/probes/TCP-Probe')]"
"id": "[concat(resourceId('Microsoft.Network/virtualNetworks', variables('VNet Name')), '/subnets/front')]"
"id": "[resourceId('Microsoft.Compute/availabilitySets', variables('Front Availability Set Name'))]"
"uri": "[concat('https', '://', parameters('Storage Account Name'), '.blob.core.windows.net', concat('/', variables('Vhds Container Name'),'/', variables('Front VM Prefix'), '-', copyIndex(),'-os-disk.vhd'))]"
"id": "[resourceId('Microsoft.Network/networkInterfaces', concat(variables('Front NIC Prefix'), '-', copyIndex()))]"
"[resourceId('Microsoft.Compute/availabilitySets', variables('Front Availability Set Name'))]"
We used the resource group named md-demo-migrate. Once we’ve tested the procedure in non-production environment, this migration procedure can be applied to production. The shutdown / convert should then be done one update domain (or one VM) at the time to avoid any downtime. Try to migrate the account type back to standard storage. We won’t be using the resource groups we have created so we can delete them.